Take I-75 South to Exit 160A, onto US Hwy 41 South (Pio Nono Avenue). Go 4.2 miles. Hwy 41 veers to the right (just before an overhead bridge). Continue on Hwy 41 South 3.2 miles. Turn left onto Avondale Mill Road. Go .4 miles. Turn left onto NE Industrial Boulevard, and you will see our signs. Take I-75 North to Byron, Georgia, exit 149. 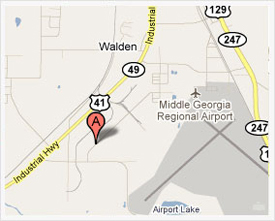 Turn right onto GA Hwy 49 North. Follow Hwy 49 for 4.4 miles. Turn right onto Avondale Mill Road. Go .4 miles.Turn left onto NE Industrial Boulevard, and you will see our signs. Enter information about your job such as size, quantity, color, coatings, special handling or mailing.